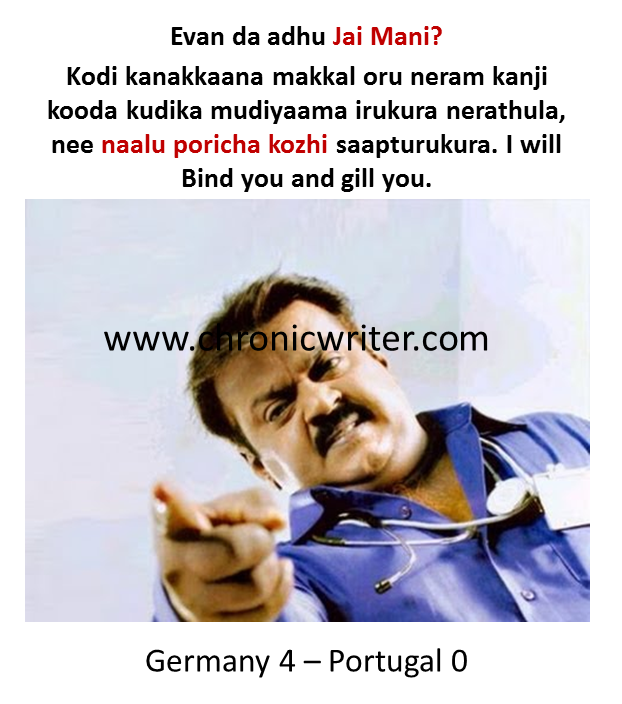 Captain Vijaykanth is very angry with Jai Mani. The reasons for his anger is depicted in the picture below. After watching the Germany- Portugal match, I found that Portugal team is the most over rated team in this world cup. I should not judge them from one match. Let us wait and see. But Ronaldo was pathetic. His freekicks were all over the place. In a desperation to score his 50th International goal, he went nuts and he started showing his dribbling stunts at a time when it was not at all needed. His speed reminded me of Inzamam Ul Haq'a running between the wickets. The Jai Mani just toyed with the Poricha Kozhis in the world cup game.